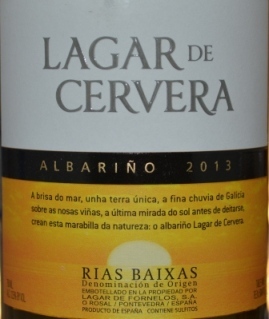 Albarinos are such a good go-to white wine for the summer months, and this bottle is a stellar Costco purchase for $14.99, representing about the best quality I’ve had in these wines at this price from the Rias Baixas region of Spain. It seems like Albarino really started to catch on in the US over the last 12 months, and I’ve seen prices steadily increase on many bottles I used to be able to buy for $10-$12 (the Nora Albarino comes to mind). So when they enter the aisles of Costco, I typically jump on them. This wine presents a nose of lemon and grassy, citrus fruit. It is medium in body and many of the same flavors come through on the palate from the nose – lots of lemon, lime, a touch of sour apple and grapefruit, all wrapped together rather nice. Perfect finish, sticky and acidic; a little dry making it hard to stop drinking. At $14.99 this is a solid buy for this region. It you want to test the waters first, I reviewed another Costco Albarino a few weeks back that I still see in stores for only $9.99, and it’s a great starting point for Albarino wines.